Art Pope: North Carolina's GOP architect. North Carolina Gov. 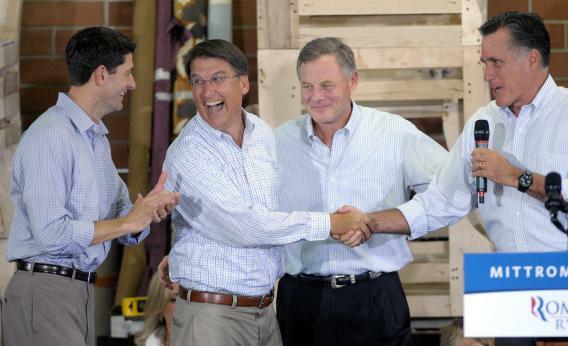 Pat McCrory laughs as he shakes hands with Mitt Romney on Aug. 12, 2012, in High Point, N.C. Somewhere offstage, Art Pope is pulling the strings. Art Pope has been quietly finessing the North Carolina politics for years; only now he has the added bonus of working in the governor’s office as deputy budget director for Gov. Pat McCrory. Pope, a founding member of Americans for Prosperity, has been called the most influential donor in the state, and served as a pro bono legal adviser to the state legislature during its 2010 redistricting push. The Civitas Institute offers what its president, Francis DeLuca, calls an “intellectual underpinning” for a variety of issues including regulatory and voting changes. For example, the group wanted to end straight-ticket voting and even early registration for 16- and 17-year-olds. Both found their way into a sweeping election law overhaul signed by the governor. “I’d like to think we had a little hand in it,” DeLuca says.